When she returns to the Caldos colony to attend her grandmother's funeral, Dr. Crusher is surprised to discover her grandmother's much younger lover, Ronin. But Ronin is not all that he seems - he is a "ghost" who has haunted Crusher's family for centuries, and has his sights set on her. The Enterprise is sent to Boraal, where Worf's adoptive brother Nikolai is assigned to a cultural observation post. The planet's atmosphere is degrading irreversibly. They are to take Dr. Rozhenko home, but the Prime Directive bars the Enterprise from helping the Boralans, who are only at a pre-industrial level of technology. Dr. Rozhenko begs the Captain to help at least some of them escape, but Picard is adamant. After the apparent final loss of the Boraalans, an odd power surge leads the crew to the holodeck, where Nikolai has recreated a small part of the Boraalan homeworld and beamed a small village aboard. 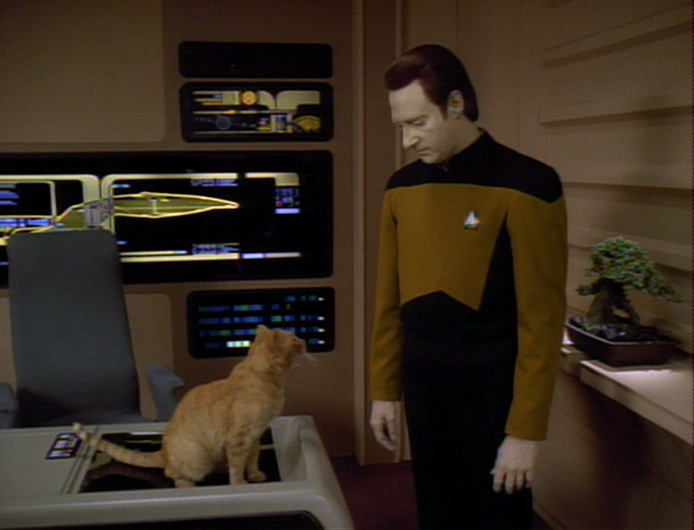 Now, Captain Picard must make decisions on behalf of an entire species that his training and conscience tell him are far beyond him. I can't believe you made me bleach my teeth for this! 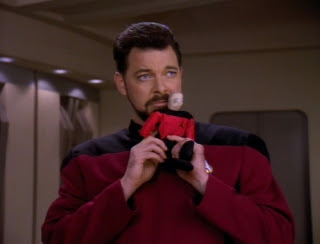 Riker whispers sweet nothings into mini-Picard's ear. 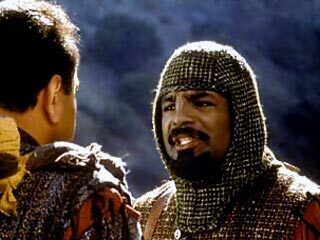 Worf returns from bat'leth tournament and begins to notice a strange pattern of events. People and objects are subtly different from one moment to the next. At first he dismisses them, but as the changes become more severe, eventually finding himself married to Counselor Troi, it becomes clear that something is affecting reality or Worf or both. You weren't like this before the beard! The Enterprise visits Atrea IV, aiding the inhabitants in an attempt to re-liquefy their planet's core. 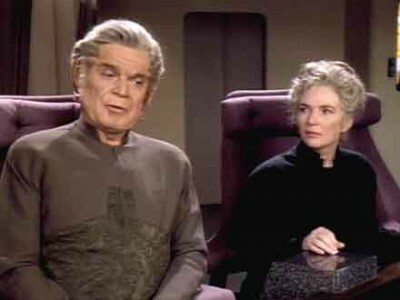 One of the planet's scientists lays a bombshell upon Data, though, when she tells him that she is his "mother," having helped Dr. Noonian Soong create him. My wife here invented Oomox, which she delivers with an almost mechanical precision and stamina. The Enterprise is searching for the Fleming, a missing medical supply ship in the Hekara corrdior, a volatile stretch of space light years across, complicating their search. They discover a pair of Hekaran scientists have been trapping and disabling ships in an attempt to attract Federation attention to their claims that the use of warp drive is damaging subspace. 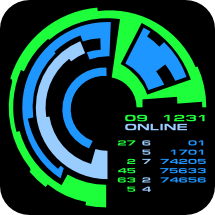 They seek an outright cessation of warp travel around their homeworld. The crew is understandably outraged at their tactics and skeptical of their claims, but the implications if they are right could irrevocably alter life in the Federation. 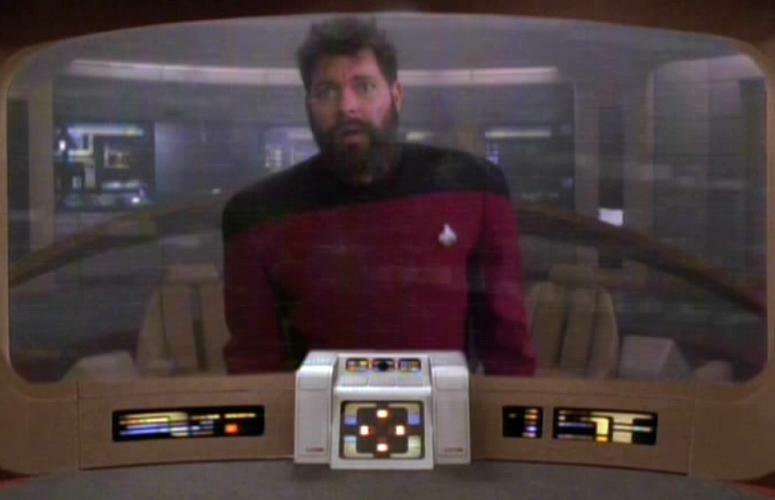 Poop on my desk again and it's into the warp core with ye'. 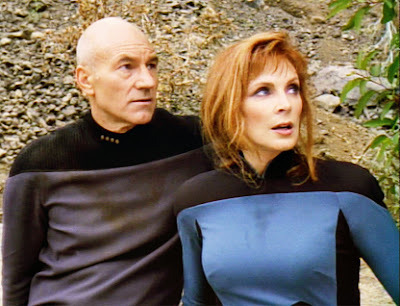 On a diplomatic mission to the divided world of Kesprytt III, Captain Picard and Doctor Crusher are waylaid by a xenophobic faction on that world. Complicating matters, however, are the devices attached to their skulls, which give them intimate insights into each others' minds. Sweaty and out of breath. Unfortunately, for none of the right reasons. Lwaxana Troi is aboard, assisting a delegation of Cairn diplomats. The Cairn are a race of advanced telepaths that have evolved without spoken language. To facilitate relations, Lwaxana has been teaching them to communicate. However, shortly after coming aboard, she begins acting erratically, even for her. Eventually she collapses into a deep coma. Deanna must find what is causing her mother's mind to shut down before it's too late. 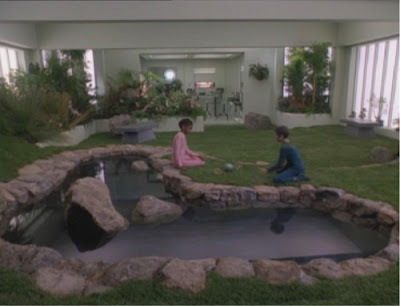 How many tragedies must occurr on the Enterprise's putt-putt golf course before they just shut it down once and for all?